I’ve never heard of Anthony’s Cookies until it popped up on the 7×7 100 Things T0 Try Before You Die list this year. When I tried my brothers fresh Strauss Creamery milk from Anthony’s, I knew this was a place I had to try. Located in the quieter part of the Mission, Anthony’s lives next to a mortuary, no pun intended. It’s basically just a storefront with a couple of bakers racks and no tables. This is strictly a buy it fresh and take it home to eat kind of deal. The cookies are gooood. The cashier was kind enough to break apart 4 cookies for us to try – cookies and cream, toffee chip, banana walnut, and semi-sweet chocolate chip. I quickly purchased a dozen for $9. Note: If you’ve purchased a bottle of milk here, you can return the bottle for $1.50 recycling credit. Here’s the break out of what I got: 4 cookies and cream, 4 semi-sweet chocolate chip and 2 toffee. Don’t be alarmed by the ring of oil stains at the bottom of the box. The cookies are sinfully good. The cookies are exactly the way I like them – thin and chewy. The cookies and cream is made from crushed Oreos and the cream from the cookies are melted into the dough. The semi-sweet is decadent. The chips used are the kind that stay melted, so it smears across your lips with each bite. The toffee chip is good as well, but may be a little too sweet for my sweet tooth. My bro actually experimented with his own Oreo cookie recipe last night and it’s a close match. It might just hold me over until my next craving for the cookies and cream cookie. 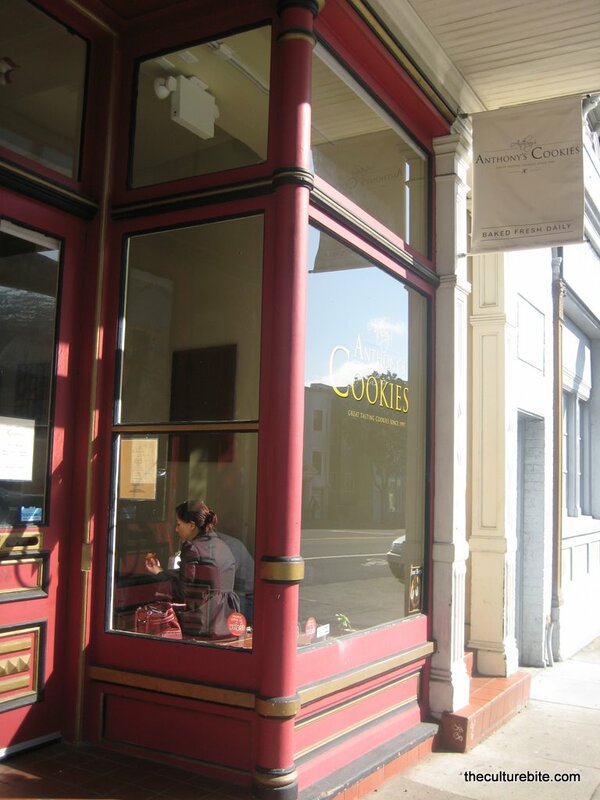 #1 – I <3 Anthony's Cookies!! I can never eat just one – always at least two!! #2 – I've never been to the actual storefront, but my cafeteria sells them!! $1 each is more expensive than Anthony's shop, but I'll gladly pay the convenience fee. Let me know if you're ever craving one during work hours, and I'll pick one (or two) up for you! I try to wait til at least mid-week to get two (one toffee chip, one cookies and cream) because if I start on Monday, I'll get one every day for the rest of the week thereafter. Oh, and Fridays after 2:30pm, the cookies are BOGO! They sell out super quick, though..
#3 – Omg, would your brother share his recipe with me???? ESA! You are sooo lucky!! Let’s do lunch this week or next if you’re free! We definitely have to eat together since we both enjoy food. I also want some cookies! I’ll have my bro send me his recipe. Basically it’s a plain cookie dough recipe with smashed up oreos. Seems pretty simple. Are you free on Thurs, Sam? I’ll bring coooooookies!! Hehe, I also went upstairs to the cafeteria today right at 2:29pm, when BOGO cookies start at 2:30pm. I bought four cookies and cream. There were no other flavors left! !